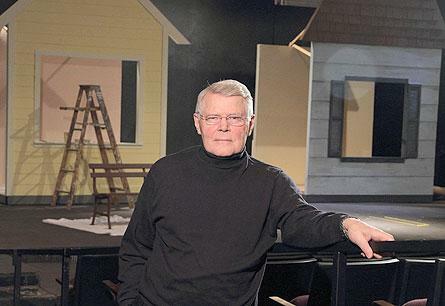 Professor John Tammi is directing his final Hope theatre play. The curtain has risen for the final time under longtime theatre professor John Tammi. Under Tammi's direction, Hope College Theatre is presenting “Middletown” by Will Eno in the DeWitt Center main theatre. It began on Friday, Feb. 14, and will continue Wednesday thru Saturday, Feb. 19-22. Performances are at 8 p.m. The production is marking the end of an era in theatre at Hope. It is the last play directed prior to retirement by John Tammi, professor of theatre, who has been a member of the faculty since 1968 and is concluding his tenure at Hope at the end of the academic year. “Middletown” was named the first recipient of the Horton Foote Prize in 2010 for Promising New American Play. “Middletown” explores the lives of people in a small American town who search for meaning and relevance with humor and poignant telling of their stories. In addition to director Tammi, the production team includes junior Molly McNair of Belleville, Wis., costume designer; faculty member Michelle Bombe, costume design mentor; junior Tessa Schultz of Grinnell, Iowa, scenic designer; faculty member Richard Smith, scenic design mentor; faculty member Perry Landes, lighting designer; and junior Josh McCammon of Ann Arbor, sound designer. Staff members include Paul Anderson, technical director; and Darlene Veenstra, costume shop manager. The show is stage managed by junior Alexandra Leppek of Freeland. The assistant stage manager is freshman Rebekah VanSlooten of Allendale. The cast includes senior Joel Brogan of Holland; junior Dylan Connor of Tallahassee, Fla.; senior Molly Coyle of Holland; senior Katie Gabriel of Holland; freshman Kelsey Marie King of Traverse City; freshman Sydney Luse of Elburn, Ill.; freshman Zach Makowski of Detroit; sophomore Mandy Scott of Newberry; junior Alexander Sloan of Ann Arbor; senior Ashley Shanice Weatherspoon of Schaumburg, Ill.; and sophomore Mason Yoder of Millersburg, Ohio. Tickets for “Middletown” are general admission, and are $10 for regular admission, $7 for senior citizens and Hope College faculty and staff, and $5 for children 18 and younger and Hope students, and are available at the ticket offices in the main lobby of the DeVos Fieldhouse, 222 Fairbanks Ave., and the Events and Conferences Office located downtown in the Anderson-Werkman Financial Center, 100 E. Eighth St. Both offices are open weekdays from 10 a.m. to 5 p.m. Tickets are also available online at https://tickets.hope.edu/ticketing/ or by calling (616) 395-7890. Jeffrey Zita, a Hope sophomore from Douglas, Mich. , recently used a Phantom drone and digital camera to take aerial images of the ice and snow at nearby Holland State Park. Dr. Eugene Heideman, who is a visiting research fellow at the A.C. Van Raalte Institute at Hope College, will present the address “Hendrik Pieter Scholte: Catalyst in the Secession of 1834” on Thursday, Feb. 13, at 4 p.m. in the Fried-Hemenway Auditorium of the Martha Miller Center for Global Communication.